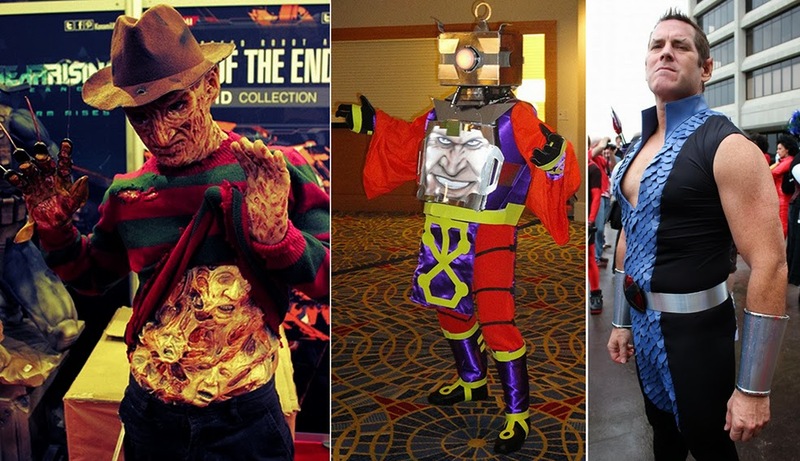 Another Tuesday, another whizz around the world of creative and cool cosplay creations. While next week will be a bit of a 'older' cosplaying special', this week we're diving into evil end of the pool, with the likes of Arnim Zola, Fantastic Four rival Namor the Sub-Mariner, and one of the biggest snakes in the grass of all of pop-culture. Let's go! Nothing reminds me of the 80's more than having my eyes wide in fright watching A Nightmare On Elm Street, then having my eyes all open all night not wanting to let Freddy have a chance to get me in my dreams. No horror movie rattled my brain like that first flick, I don't think I even blinked for days! With the attention to detail this cosplayer has gone to, I'm guessing many who saw him live are saying the same thing. That soul chest is as genius as it is brrrr. With the Superbowl having just closed for another year, no doubt plenty of parents warned their kids of sitting too close and getting square eyes. The ultimate vision of that old wives tale has to be Captain America's foe Arnim Zola. The genetic engineer was found on this forum listed as 'Chest Face' - ohh if only they knew. Marvel's Namor The Sub-Mariner is the perfect pulp anti-hero. While he's almost ditched his not so good side in the modern Marvel (Phoenix Namor notwithstanding) this guy even pulls off the attitude of the King of the Seven Seas. 'Imperius Rex!' he yelled as he though photographer David Ngo still had the lenscap on. Rounding out this week's devilish circle is The Baroness. As a kid I always thought she was the vilest snake in Cobra, and consistently waited for her to kick Destro and Cobra Commander aside, and lead Cobra herself (Mind you I also thought the same of Evil-Lyn and Skeletor so there might be a theme there). Jennifer is a cosplayer all the way from the shores of Italy, and that European look sure helps add to the characters trancing stare. She has cosplayed as Lara Croft, X-23 and more, and also produces a wide range of fan art,all of which you can see here. "Destro! Destro and the Baroness- are practicing their clarinets! Destro and The Baroness- practicing their clarinets- THEY'RE PRACTICING THEIR CLARINETS!!!" Top-notch job on that Arnim Zola costume. Gosh that guy playing Namor looks fat. Thanks guys! King, you know that's going to be what I'm humming all day now too. Cheers for that mate. Comicsfan, I know right - how many times does Zola show up at a Con? Bout time - that's how many! Karl, he's more in shape than I am buddy. Last time I went in cosplay people thought I was one of Hawkeye's arrows. True story (grabs a doughnut). You think that's dedication Dale, wait till you see next week's 'Older Persons' Cosplay special. It'll make you say 'aww' and 'wow' in equal doses. (Sigh) why does evil always look so good. I blame Dr Doom - he started it.